As an totem animal, the pheasant represents the power of perserverance and confidence. This bird aids in bringing healing to family matters with a new sense of closeness. It is also a symbol of fertility and sexuality. The coyote skull (shown antiqued) is suspended in a circle of coyote fur that is approximately 15 inches in diameter. Total diameter, including the crossed arrows is approximately 24 inches. 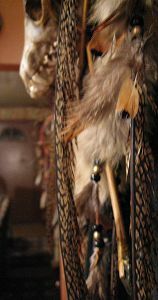 The circle is covered in coyote fur and the buckskin streamers holding the feathers are decorated with glass crow beads and brass beads with pheasant feathers (shown), imitation eagle feathers, bronze or barred turkey feathers, or goose feathers. 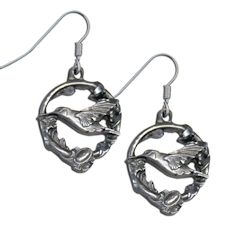 This product was added to our catalog on 12/07/2008.